Background: Randomised data in men show a small but significant reduction in the risk of adult-onset asthma among those given aspirin. The results from an observational study in women suggest that frequent use of aspirin decreases the risk of adult-onset asthma, but randomised data in women are lacking. A study was undertaken to test the effect of 100 mg aspirin or placebo on alternate days on the risk of adult-onset asthma in the Women’s Health Study. Methods: A randomised, double-blind, placebo-controlled clinical trial of aspirin and vitamin E was performed in apparently healthy women with no indication or contraindication to aspirin therapy and no history of asthma at study entry. Female health professionals self-reported an asthma diagnosis on yearly questionnaires. 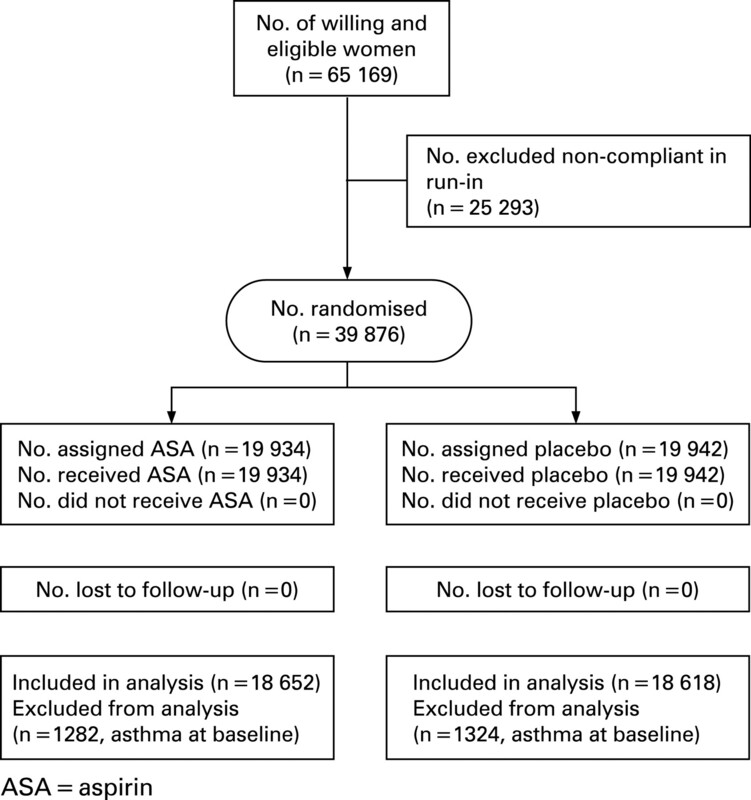 Results: Among 37 270 women with no reported history of asthma prior to randomisation and during 10 years of follow-up, there were 872 new cases diagnosed with asthma in the aspirin group and 963 in the placebo group (hazard ratio 0.90; 95% CI 0.82 to 0.99; p = 0.027). This apparent 10% lower relative risk of incident adult-onset asthma among those assigned to aspirin was significantly modified by body mass index, with no effect in women with a body mass index of ⩾30 kg/m2. The effect of aspirin on adult-onset asthma was not significantly modified by age, smoking status, exercise levels, postmenopausal hormone use or randomised vitamin E assignment. Conclusions: In this large randomised clinical trial of apparently healthy adult women, administration of 100 mg aspirin on alternate days reduced the relative risk of a newly reported diagnosis of asthma. The Women’s Health Study (WHS), a large-scale, randomised, double-blind, placebo-controlled trial of aspirin and vitamin E, provided a unique opportunity to test whether low-dose aspirin decreases the risk of a newly reported diagnosis of adult-onset asthma in apparently healthy women with no indication or contraindication for aspirin therapy. The WHS was a randomised, double-blind, placebo-controlled, two-by-two factorial trial testing the risks and benefits of low-dose aspirin (100 mg every other day; Bayer AG, Leverkusen, Germany) and vitamin E (600 IU every other day; National Source Vitamin E Association, Washington, DC, USA) in the primary prevention of cardiovascular disease and cancer. The WHS randomised 39 876 female health professionals between April 1993 and January 1996; of these, 19 934 were assigned to active aspirin and 19 942 to placebo. The results of the trial11–13 and methods used to identify and recruit the study population have been described in detail previously.14 ,15 In brief, invitational letters were mailed to 1 757 247 female health professionals throughout the United States and Puerto Rico, of whom 453 787 returned the initial study questionnaire. Women were considered eligible if they indicated willingness to participate, were aged ⩾45 years with no previous history of coronary heart disease, cerebrovascular disease, cancer (except non-melanoma skin cancer) or other major chronic illness. Eligible women also had no history of side effects to any study medications, were not taking aspirin or non-steroidal anti-inflammatory drug medications more than once a week (or were willing to forego use of these medications during the trial), were not taking anticoagulants or corticosteroids, and were not taking individual supplements of vitamin A, E, or β-carotene more than once a week. Of the women who returned the initial study questionnaire, 65 169 were willing and eligible to participate and enrolled in a 3-month run-in period employing all placebo medications, designed to identify a group of participants with a higher likelihood of good long-term compliance. Of these, 39 876 were compliant during the run-in phase and were randomised into the trial (fig 1). Figure 1 Flow diagram of the progress through the phases of the Women’s Health Study. Baseline information was collected by mailed questionnaires that asked about many anthropometric, demographic, clinical and lifestyle variables. Twice in the first year and yearly thereafter, follow-up questionnaires were sent out asking about compliance with study medication, development of side effects, newly developed diseases that required medical attention including asthma, dates of diagnoses, and personal characteristics and habits. On each of the follow-up questionnaires, the participating female health professionals were specifically asked about newly diagnosed diseases including asthma and the date of diagnosis of these diseases. Asthma was not a prespecified end point of the WHS. All reports of asthma from enrolment until the end of the randomised trial on 31 March 2004 were included. A total of 2606 participants (1282 in the aspirin group and 1324 in the placebo group) who indicated an asthma diagnosis prior to randomisation were excluded, leaving 37 270 participants without a history of asthma at baseline. Continuous baseline measurements were compared using the Student t test and categorical variables were compared using the χ2 test according to aspirin or aspirin-placebo assignment. Following the intention-to-treat principle, we compared the cumulative incidence of adult-onset asthma over the trial follow-up period. A Cox proportional hazards model was used to analyse the association between randomised aspirin assignment and time from randomisation to date of the reported asthma diagnosis. Furthermore, we assessed whether the effect of aspirin on adult-onset asthma was modified by age (<55, 55–64, ⩾65 years), smoking status (never, past, current), body mass index (<25, 25–29.9, ⩾30 kg/m2), exercise (rarely, <1/week, 1–3 times/week, ⩾4 times/week), postmenopausal hormone use (never, past, current) and randomised vitamin E assignment. Statistical significant effect modification was tested by contrasting main effect models with models that also included interaction term indicators using the likelihood ratio test. Table 1 summarises the baseline characteristics of the 37 270 participants without a reported history of asthma at study entry according to randomisation to aspirin treatment. As expected in this large sample, the baseline characteristics were well balanced between the aspirin and placebo groups. Over a mean follow-up period of 9.7 years (362 120 person-years), a total of 1835 participants reported new diagnoses of asthma which corresponded to a cumulative incidence of adult-onset asthma of 4.9%; 872 new diagnoses of asthma were reported in the aspirin group and 963 in the placebo group (table 2). This corresponded to a hazard ratio of 0.90 (95% confidence interval (CI) 0.82 to 0.99; p = 0.027) for newly reported adult-onset asthma, representing a 10% reduction in relative risk in favour of aspirin. 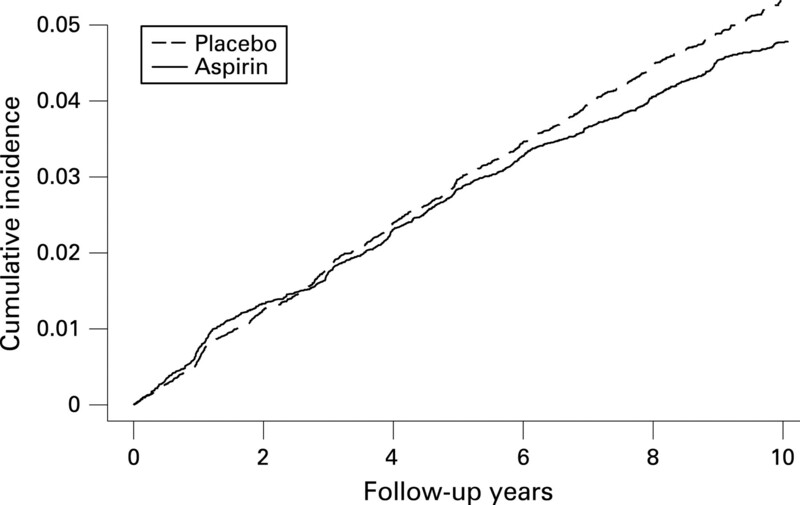 The cumulative incidence of asthma in the aspirin and placebo groups over the follow-up period is shown in fig 2, indicating a constantly decreasing risk of adult-onset asthma in the aspirin group after approximately 6 years of follow-up. Figure 2 Cumulative incidence of adult-onset asthma during the randomised component of the Women’s Health Study. There were no statistically significant differences in the observed effect of aspirin on adult-onset asthma by age, smoking status, levels of exercise, postmenopausal hormone intake or randomised vitamin E assignment (table 2). In contrast, body mass index significantly modified the effect of low-dose aspirin on reported asthma diagnosis (p = 0.002), indicating no apparent effect of aspirin on the incidence of asthma in women with a body mass index of ⩾30 kg/m2 (hazard ratio 1.19, 95% CI 0.99 to 1.42). A similar lack of association was seen when we further categorised high body mass index values (data not shown). The effect of aspirin on the occurrence of asthma was also significantly modified by linear body mass index (p = 0.008). In this large, randomised, double-blind, placebo-controlled trial in apparently healthy women, 100 mg aspirin every other day significantly reduced the relative risk of newly reported adult-onset asthma diagnosis by 10%. The magnitude of the reduction was similar across subgroups of age, smoking status, exercise, postmenopausal hormone intake and randomised vitamin E intake but was absent in those who were obese. Our data are consistent with findings in men from a post hoc analysis of the randomised aspirin component of the Physicians’ Health Study9 which showed a statistically significant reduction of 20% in the relative risk of newly reported diagnoses of adult-onset asthma (hazard ratio 0.78, 95% CI 0.61 to 1.00, p = 0.045) in men randomly assigned to 325 mg aspirin every other day compared with men assigned to placebo. The smaller effect estimate in the current study may have been due to the lower aspirin dose in the WHS (100 mg every other day) compared with that in the Physicians’ Health Study (325 mg every other day). However, gender differences in the association between aspirin and adult-onset asthma may also account for the reduced effect in women. Our results are also consistent with previous findings from a large prospective observational cohort study of female registered nurses in which women who self-selected for frequent aspirin use (15 days or more per month) had a 40% lower risk of newly reported physician diagnosis of adult-onset asthma than women who did not take aspirin.10 The stronger effect size may be due to higher aspirin doses or to residual confounding. However, when the attributable incidence rate from the randomised data of the WHS (5.3/10 000 women per year), the randomised data of the Physicians’ Health Study (5.9/10 000 men per year)9 and the observational data from the Nurses’ Health Study (4.4/10 000 women per year)10 are compared, the results are very similar. The precise biological mechanism by which long-term low-dose aspirin use may reduce the risk of asthma is currently unknown and should be the target of future studies. Several mechanisms that relate to immune-mediating effects of aspirin, which act via cyclooxygenase (COX)-dependent23 and COX-independent pathways, can be envisaged. The effect of inhibiting COX with regard to asthma is probably dependent on the balance between proinflammatory prostaglandin D2, prostaglandin F2α, thromboxane A2 and anti-inflammatory prostaglandin E2 production.23 Aspirin irreversibly inhibits the isoenzyme COX-1 which can lead to a reduction in prostaglandin E2 and subsequently to a reduction in the synthesis of interferon-γ of Th1 lymphocytes.24 ,25 Consistent with this mechanism, aspirin inhibits the activation of NF-κB26 and interleukin (IL)4 gene expression in T cells. Therapeutic doses of aspirin also inhibit IL4- and IL13-induced activation of STAT6 via non-COX dependent pathways.27 Conversely, aspirin promotes STAT1 activation in interferon-γ signalling.28 Aspirin therefore seems to inhibit Th2 immune responses while promoting Th1 responses. Since asthma has been associated with cytokine production of the Th2 phenotype,29 a shift towards a non-asthmatic Th1 phenotype may lead to reduced susceptibility to asthma. An additional non-COX activity of aspirin—but not of COX-2 inhibitors—is its potent induction of lipoxin A4 and 15-epi-lipoxin A4.30 These products of arachadonic acid metabolism have profound anti-inflammatory properties that block airway hyperresponsiveness and pulmonary inflammation in murine models31 and in vivo,32 and are currently seen as novel targets for asthma therapies. The strengths of this trial include its randomised, double-blind, placebo-controlled design, large number of participants and outcome events, as well as the high rates of follow-up and compliance. Several limitations should be considered when interpreting our results. Although this large trial had adequate size to detect a small to moderate benefit of low-dose aspirin on incident adult-onset asthma, the trial was not designed to test this specific hypothesis. The occurrence of incident adult-onset asthma was based on self-reports by the participating health care professionals and, thus, random misclassification is possible. We did not collect information on aspirin-intolerant asthma in the WHS. However, since the WHS was a trial of aspirin, participants are expected to tolerate aspirin well. Chronic obstructive pulmonary disease (COPD) can be misdiagnosed as adult-onset asthma, even in health professionals.34 Owing to the randomised prospective design, however, such misclassification would be expected to result in an underestimation of effect. Supporting this line of reasoning, the effect of aspirin was somewhat stronger among never smokers and weaker among current smokers, who are more likely to develop COPD. In addition, when we censored participants who reported a diagnosis of COPD during follow-up, the results were similar (data not shown). Finally, the WHS was composed of apparently healthy female health professionals aged ⩾45 years of whom the majority were white. Thus, generalisability to other populations may be limited. In summary, 100 mg of aspirin every other day reduced the relative risk of newly reported diagnoses of adult-onset asthma in this large randomised trial of apparently healthy women. Although aspirin can worsen symptoms in some patients with asthma, our biologically plausible finding—along with similar results from a large randomised trial in men and observational cohort studies in women—suggests a small benefit of aspirin for the prevention of the development of asthma in adults. However, before public recommendations are provided, results from randomised trials are needed that are specifically designed to test whether low-dose aspirin reduces the risk of asthma. We are indebted to the participants in the Women’s Health Study for their outstanding commitment and cooperation, to the entire Women’s Health Study staff for their expert and unfailing assistance, and to Eunjung Kim, MSc, for programming assistance.
. Are asthma and allergies in children and adolescents increasing? Results from ISAAC phase I and phase III surveys in Munster, Germany. Allergy 2003;58:572–9.
. Obesity, smooth muscle, and airway hyperresponsiveness. J Allergy Clin Immunol 2005;115:925–7.
. Prospective study of body mass index, weight change, and risk of adult-onset asthma in women. Arch Intern Med 1999;159:2582–8.
. Dietary antioxidants and asthma in adults: population-based case-control study. Am J Respir Crit Care Med 2001;164:1823–8.
. Does living on a farm during childhood protect against asthma, allergic rhinitis, and atopy in adulthood? Am J Respir Crit Care Med 2001;164:1829–34.
. The European Community Respiratory Health Survey: what are the main results so far? European Community Respiratory Health Survey II. Eur Respir J 2001;18:598–611.
. Over-the-counter medication use among US preschool-age children. JAMA 1994;272:1025–30.
. Hypothesis: decreased use of pediatric aspirin has contributed to the increasing prevalence of childhood asthma. Ann Allergy Asthma Immunol 1998;81:347–51.
. Aspirin and decreased adult-onset asthma: randomized comparisons from the physicians’ health study. Am J Respir Crit Care Med 2007;175:120–5.
. A randomized trial of low-dose aspirin in the primary prevention of cardiovascular disease in women. N Engl J Med 2005;352:1293–304.
. Low-dose aspirin in the primary prevention of cancer: the Women’s Health Study: a randomized controlled trial. JAMA 2005;294:47–55.
. Vitamin E in the primary prevention of cardiovascular disease and cancer: the Women’s Health Study: a randomized controlled trial. JAMA 2005;294:56–65. , for the Women’s Health Study Research Group. The Women’s Health Study: summary of the study design. J Myocardial Ischemia 1992;4:27–9.
. Baseline characteristics of participants in the Women’s Health Study. J Womens Health Gend Based Med 2000;9:19–27.
. Prevalence of asthma with aspirin hypersensitivity in the adult population of Poland. Allergy 2003;58:1064–6.
. Prevalence of asthma, aspirin intolerance, nasal polyposis and chronic obstructive pulmonary disease in a population-based study. Int J Epidemiol 1999;28:717–22.
. The prevalence of aspirin intolerant asthma (AIA) in Australian asthmatic patients. Thorax 2002;57:569–74.
. Aspirin-induced asthma: clinical aspects, pathogenesis and management. Drugs 2004;64:2417–32.
. Asthma relieved by aspirin and by other cyclo-oxygenase inhibitors. Thorax 1978;33:664–5.
. Asthma improved by nonsteroidal anti-inflammatory drugs. Ann Intern Med 1978;88:508–11.
. Asthma relieved by acetylsalicylic acid and nonsteroid anti-inflammatory drugs. Respiration 1984;46:121–7.
. The COX-1/COX-2 balance in asthma. Clin Exp Allergy 1998;28:1050–8.
. Prostaglandin E2 inhibits production of Th1 lymphokines but not of Th2 lymphokines. J Immunol 1991;146:108–13.
. Prostaglandin E2 differentially modulates cytokine secretion profiles of human T helper lymphocytes. J Immunol 1993;150:5321–9.
. Inhibition of NF-kappa B by sodium salicylate and aspirin. Science 1994;265:956–9.
. Aspirin and salicylates inhibit the IL-4- and IL-13-induced activation of STAT6. J Immunol 2002;168:1428–34.
. Salicylate-enhanced activation of transcription factors induced by interferon-gamma. Biochem J 1999;342:503–7.
. Asthma. N Engl J Med 2001;344:350–62.
. Interaction of a selective cyclooxygenase-2 inhibitor with aspirin and NO-releasing aspirin in the human gastric mucosa. Proc Natl Acad Sci USA 2003;100:10937–41.
. The use of analgesics in patients with asthma. Drug Saf 2001;24:829–41.
. Lipoxins are potential endogenous antiinflammatory mediators in asthma. Am J Respir Crit Care Med 2002;165:1531–5.
. Obesity and asthma. Am J Respir Crit Care Med 2006;174:112–9.
. Validation of self-reported chronic obstructive pulmonary disease in a cohort study of nurses. Am J Epidemiol 2002;155:965–71. Funding: The Women’s Health Study is supported by grants from the National Heart, Lung, and Blood Institute (HL-43851) and the National Cancer Institute (CA-47988). RGB was supported by a Robert Wood Johnson Generalist Physician Faculty Scholar Award. Competing interests: TK has received investigator-initiated research funding from the National Institutes of Health, Bayer AG, McNeil Consumer & Specialty Pharmaceuticals, and Wyeth Consumer Healthcare; he is a consultant to i3 Drug Safety and received an honorarium from Organon for contributing to an expert panel. RGB has received investigator-initiated research funding from the National Institutes of Health, including as co-investigator on one study for which aspirin was donated by Bayer. JMG has received investigator-initiated research funding and support as Principal Investigator from National Institutes of Health, BASF, DSM Pharmaceuticals, Wyeth Pharmaceuticals, McNeil Consumer Products and Pliva; received honoraria from Bayer and Pfizer for speaking engagements, and is a consultant for Bayer, McNeil Consumer Products, Wyeth Pharmaceuticals, Merck, Nutraquest and GlaxoSmithKline. JEB has received investigator-initiated research funding and support as Principal Investigator from the National Institutes of Health and Dow Corning Corporation; research support for pills and/or packaging from Bayer Heath Care and the Natural Source Vitamin E Association; honoraria from Bayer for speaking engagements; and serves on an external scientific advisory committee for a study by Procter & Gamble. Ethics approval: All women gave written informed consent and the Institutional Review Board of Brigham and Women’s Hospital approved the Women’s Health Study. The study sponsors had no role in the study design, the collection, analysis and interpretation of data, the writing of the report, and the decision to submit the paper for publication. TK had full access to all the data in the study and takes responsibility for the integrity of the data, the accuracy of the data analysis and for the decision to submit for publication. Aspirin and asthma: barking up the right tree?